Fourth grade students quiet themselves during a mindfulness exercise to be ready to resume learning. Mid-Week Focus this week features mindfulness, a trending tool to help children sustain concentration in school. Reports are that students who learn to practice mindfulness gain the ability to pay closer attention, calm themselves, and stay focused so that they can master knowledge and skills. This assertion is presented by a growing number of educators and psychologists worldwide. According to Lorraine Hobbs, director of youth and family programs at the University of California-San Diego’s School of Medicine and Center for Mindfulness (as reported in a recent article by Mary MacVean in the Los Angeles Times), schools are paying close attention to the benefits of mindfulness. Mindfulness is trending in part, experts assert, because kids are under more pressure than ever before to pass tests. Pressured children become anxious and distracted. Teachers who lead mindfulness exercises observe improvements in students’ ability to sustain concentration throughout the school day. MacVean, the LA Times reporter, cites a statistic offered by Chris McKenna, the program director at Mindful Schools in Emeryville , CA: 48 states in the US have mindfulness programs. 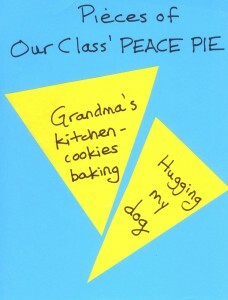 Ask kids to write what calms them on pieces of a PEACE PIE to help them prepare to focus at the start of a school day. Ask the children to write words on their pie pieces that describe what or where makes them feel calm. 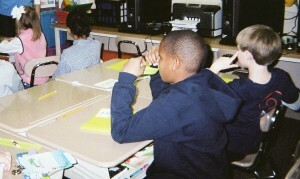 Instruct students to sit quietly for a few minutes holding their pie pieces and picturing themselves in that calm. 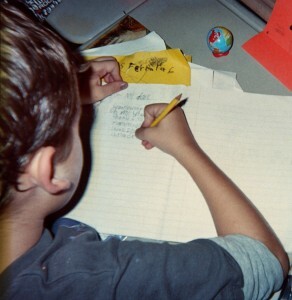 Offer the option for children to write words or draw a picture that identifies the activity or place that calms them. Collect the pie pieces and post them in a circle on a bulletin board. 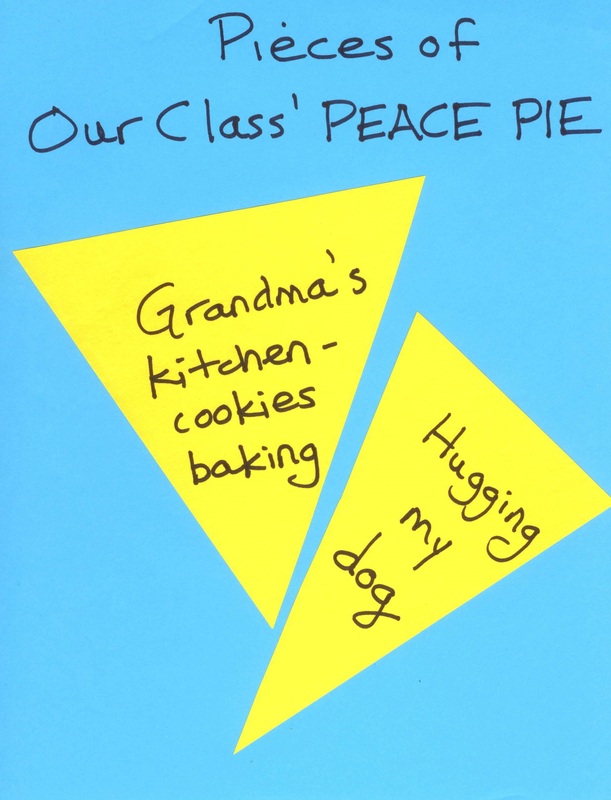 Post a header that reads, OUR CLASS’ PEACE PIE. Children can also practice mindfulness after recess to “regroup” for lesson time, and at other times when a teacher notices that students’ focus is fading. Take a few minutes out from your pressed school schedule and ask your class to “pause their minds” and look with you at a blank white board. Any blank classroom space will do. Tell the class that you want to ask two open-ended questions that allow totally free thinking, with no right or wrong answers. “Here’s my two-part question for you..
1) What would you like to learn today? Listen for students’ answers. Jot their responses on the blank board in a dark marker. Call their contributions a New Checklist for Learning. Giving kids an opportunity to ask for what they want is a mindfulness exercise and big attention-getter. Blank spaces can be a refuge when information overload strikes. They can also be useful teaching tools. Invite students to enjoy a mind-wandering time by writing a short silly rhyme. Mindfulness includes recognizing the benefits of humor. Take a Minute for Mini Mind-Wandering Time! – During transition time between lessons, tell the class that everyone is invited to take a minute for mind-wandering before coming back together to focus on learning. Mini mind-wandering is a mindfulness exercise that helps everyone de-stress for a few minutes. Short breaks of quiet private thought refresh body and soul. The key is to ask kids to “climb into their private QUIET mind-wandering zones for Mini Mind-Wandering Time.” Explain the importance of quiet to mind-wandering. Offer the option for students to use Mini Mind-Wandering Time to write made-up silly words and phrases on blank sheets of paper. Being allowed to be silly, if only for a few minutes, is a big destressor. Signal the close of Mini-Mind Wandering time with a musical cue. Music is a soft way to bring minds back from breaks. Trends come and go, but current research suggests that mindfulness is a trend on the rise, and with good reason. Please send comments about attention-getting mindfulness exercises that you use. ‹ Another Cool Attention-Getting Tool – Host a Let’s Go Loony Day! 1 Pings/Trackbacks for "What’s Trending? Mindfulness in Elementary Schools to Help Kids Sustain Concentration"